There are some games like Chess, Draughts (Checkers), or Go that are incredibly simple and so easy to teach, but can take ages to master. These games usually have a set of really simple rules and a win condition, that is easily understood. Hive is one of those games. 1 Queen Bee: Can move exaclty once space. 2 Spiders: Can move exactly 3 spaces. 3 Soldier Ants: Can move around the outside of the hive as many squares as required. 2 Beetles: Can mount the hive and move exactly once space. There are expansions that add a Mosquito, a Ladybird and a Pill-bug, the first two are included in the Pocket and Carbon edition out of the box. Players take turns either placing a piece or moving a piece, with the ultimate goal of surrounding their opponent’s Queen Bee. 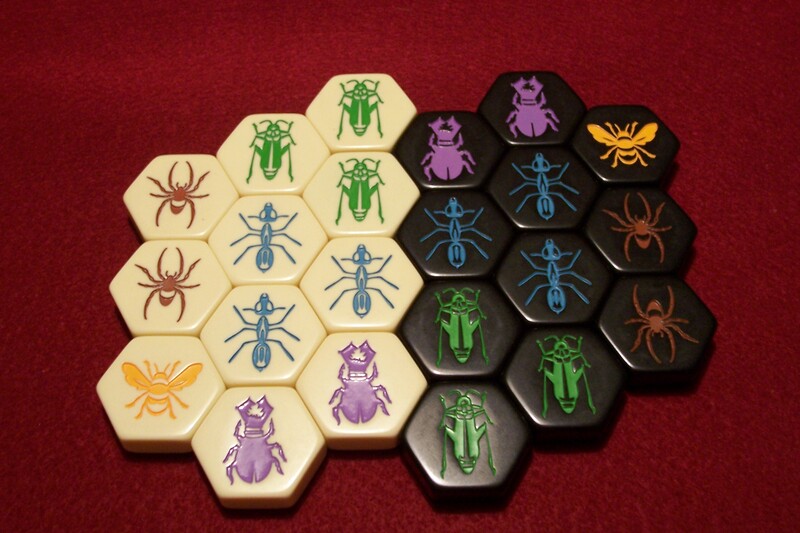 The only real rules are that you have to place your Queen within your first three turns, you can’t move any placed pieces until you have placed your queen, and you cannot break the hive. Of course within that is a world of strategy, do you place the queen early or late? Do you go on the full offensive and hope that you can capture your opponent’s queen before your opponent? or do you play defensively moving your queen out of the way? Can you trap your opponents crucial pieces to prevent them from using them? The beauty of this game is the simplicity and variety of bugs, which allows for and astounding amount of variance in game-play styles. Although when playing with just one opponent I’ve found that the game can fall into a stagnant rhythm of playing the same moves or trying variations on the same strategy, which can get very frustrating, it’s astounding when playing with a new player how you get those “I never thought of doing that!” moments. Sometimes you just have to think outside the box. 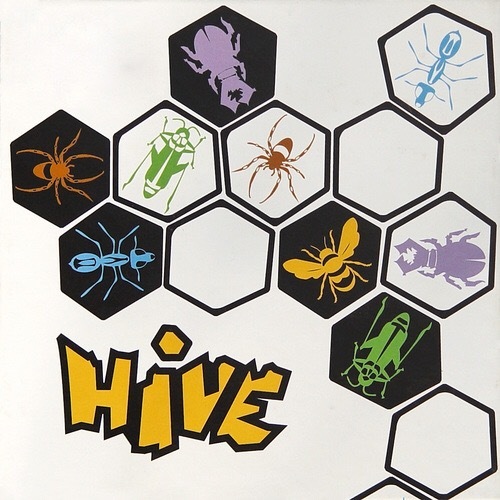 Hive probably isn’t as deep as Chess for example, but it’s a lot less intimidating, and for a new player it has the advantage that there aren’t books upon books written on how to play this game effectively, I’m sure there are winning strategies and patterns to be discovered but I think that the permutation space for hive might actually be large enough that it’ll take a while for them to be figured out. Putting all that aside, hive is a joy to look at, the pieces are gorgeous. 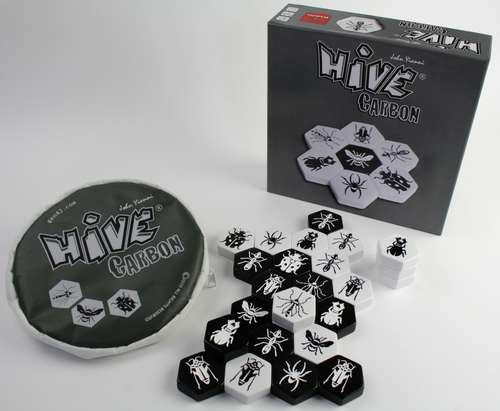 Whether you are playing the original game, the pocket edition, or the new “Carbon” edition, the hexagonal pieces are stunning, and feel really nice in your hand, like Dominoes or nice Mah Jong tiles. 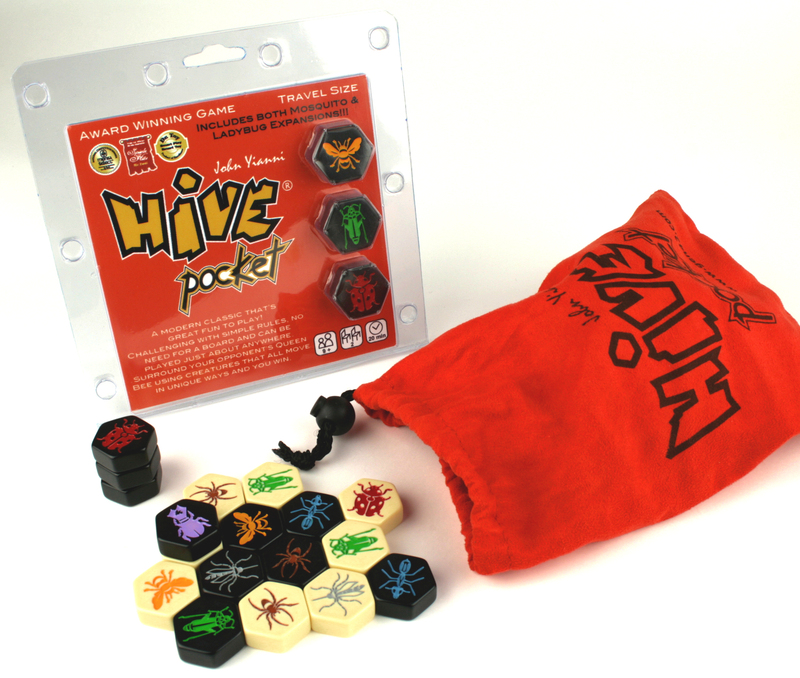 Hive is also a great travel game for two people, it takes up very little space, and comes with a carry case/bag to keep all the tiles in (At least Carbon and Pocket do) and you can play it on any flat surface. 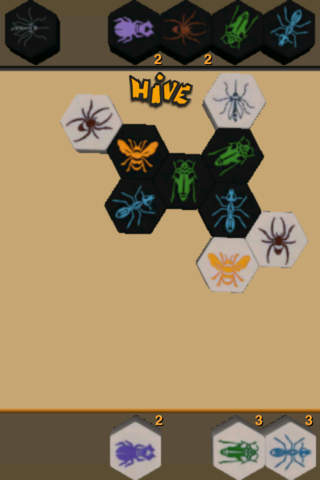 Hive is also available on iOS (£1.49) and Android (Free).